This scan of a vintage postcard shows Lieutenant John Macready (one of the 1923 Fokker T-2 transcontinental flyers), Lieutenant Leigh Wade (the pilot of the Douglas World Cruiser "Boston", and Major Rudolf W. Schroeder (who set an altitude record in 1920). Maj. Rudolph W. Schroeder "This photo was obtained from a family member of Franklin (Frank) Taylor Wheeler, Jr., who was born March 15, 1896 at New Bloomfield, Pa. He served overseas June 23, 1918 to June 26, 1919 in Hq. Co. 3 Regt Air Service and was discharged July 7, 1919 as Sergeant. In 1934 he lived at 323 Broadway, Santa Monica, Cal". from WHO'S WHO IN AMERICAN AERONAUTICS, 1926 Automotive business; born Chicago, Ill., Aug. 14, 1885; Crane Tech. School of Chicago. Aeronautical Activities and War Service: Built gliders 1908 to 1910; Airplane Mechanician to Otto Brodie (Farman); learned to fly under him, 1910 to 1913; mechanician to many prominent exhibition fliers; World's Altitude Record, Sept. 18, 1918, 28,000 ft.; won first place in the Handicap Event, of the N.Y. to Toronto Race, in Aug. 1919; Two Man World's Altitude Record, 33,500 ft., Jan. 13, 1920; One Man Altitude, World's Record, 38,180 ft., Feb. 27, 1920; U. S. Air Service Pilot in the Gordon Bennett, Sept. 1920; 1921 to 1925, Aviation Engr., Underwriter's Laboratories; 1925 to date, Ford Airport; Major, U. S. Air Service, Test Pilot, Air Service Engr. Div. Flying Rating: R. M. A.; enlisted Aviation Section, Oct. 1916; Chief test pilot, 1918 to 1920.
by Henry Serrano Villard, 1987 Rudolph William Schroeder was born in Chicago on 14 August, 1886 and began glider experiments in 1909. He was a mechanic for Otto Brodie, one of the earliest exhibition flyers, until 1913, when he joined Mickey McGuire and his Curtiss pusher in exhibitions. McGuire was killed in 1914 flying with the Mexican army, and 1915 found Schroeder giving exhibitions on his own. In 1916 he was associated with the aviatrix Katherine Stinson as an expert on rotary motors. He enlisted in the aviation section of the U.S. Army Signal Corps in October 1916 and was rapidly promoted, becoming a major in September 1918. 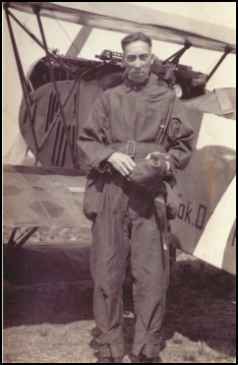 Schroeder was the chief test pilot at McCook Field, where he insisted on the development of a free-type parachute pack as invented by Floyd Smith and in 1919 was the first air service aviator to wear one. 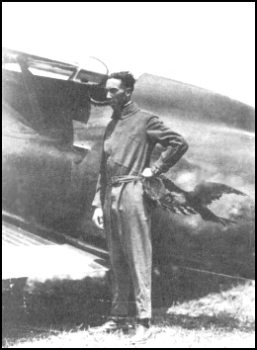 He was credited with being the first to fly with a supercharged engine and the first to open a night-flying school. 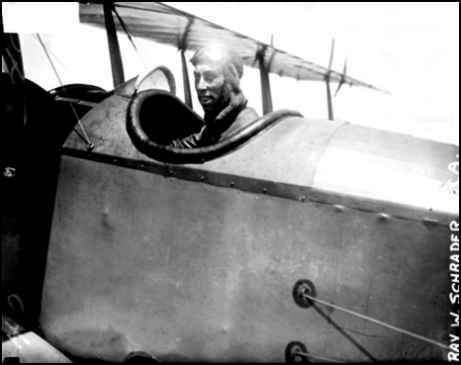 On September 1919 he set a new altitude record at Dayton with Lt. G. Elfrey as passenger, reaching 28,900 feet in a Lepere biplane built by Packard Motor Car Co. of Detroit and equipped with a 400-horsepower supercharged Liberty motor. On 4 October he pushed the mark up further to an uncorrected altitude of 33,335 feet (McCook Field, where the flight was made, reported corrections later that brought the figure down to 31,796 feet). Schroeder placed first in the 1919 New York-Toronto reliability race. Schroeder exuded confidence in his chances of winning the Gordon Bennett. In his letter to the Aero Club, he said, "From all indications, it looks to me as though the next Gordon Bennett will be held in America." I was privileged to know Henry during several years before his death. He was an fascinating companion and a lifetime friend of aviation. for the complete story of the Gordon Bennett Race. ONLINE RESOURCES If you search for "Rudolph W. Schroeder", using the Google search engine, (6-24-04), you will find about 23 links. Some of the most helpful are the following. Schroeder's Altitude Flights, 1918-1920 This page on the USAF Museum website offers a resum� of his activities and includes four interesting photographs. Included is a photograph of items belonging to Maj. R. W. Schroeder and which were associated with his High Altitude flights in 1918-1920. Donated by his son, Leonard R. Schroeder, Oakland California. You can access the page by clicking on the title above. Maj Rudolph W. Schroeder This page on the Birthplace, Home, and Future of Aerospace. . .The Evolution of Aeronautical Development at the Aeronautical Systems Center website of the ASC History Office, Wright-Patterson Air Force Base, offers a very nice biography, illustrated with two photographs. You can access the page by clicking on the title above. 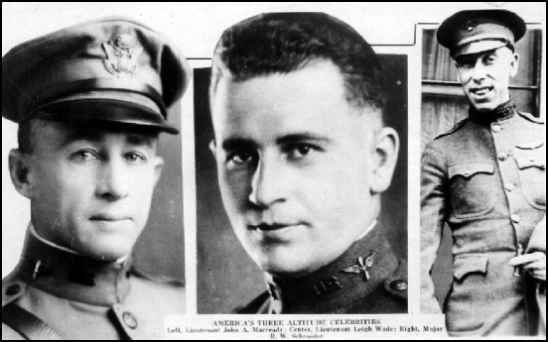 If time permits, I suggest that you go to the homepage of the site, by clicking on the name above, and take advantage of the other materials which are available.Among the twelve chapters, you will find three dealing with the early period from the Wright Brothers, through the "Establishment of Signal Corps Aviation and World War I," to the "Aeronautical Systems Center Starts at McCook Field, 1915." In addition there is a chapter offering "Biographies" which includes some 17 notables, many of them pioneers. This is a remarkably valuable new resource. NATIONAL AIR TOUR In 2003, The Aviation Foundation of America recreated the 1925-1931 National Air Tours in celebration of the Centennial of Flight. On their website, which you can access by clicking on the title above, offers many features, including an online version, in PDF format, of the book "The Ford Air Tours, 1925-1931." You will find a brief references to Rudolph Schroeder's participation in the tour in this chapter. Chapter VIII The Last Pathfinder You may want to use the "FIND" function to locate the two references, one on page 32, the second on page 37. If time permits, I suggest that you visit the homepage by clicking on the title at the top and take advantage of the many features of the site.